(New Orleans, La) The chatter was consistent all week — the Mercedes-Benz Superdome crowd was going to be electric. Rams run game coordinator Aaron Kromer was coaching for the Saints the last time the team hosted an NFC Championship game back in the 2009 season, and said that was the loudest he ever heard it there. Wide receiver Robert Woods’ face appeared on the jumbotron, giving his thoughts from his Friday press conference about how he didn’t feel like the crowd would be a determining factor in the game. That was designed, of course, to be a challenge to the New Orleans crowd to be even louder. Apparently not — but the Goff and the Rams’ offense did have to overcome some significant adversity early on in the game. Goff said that just before Los Angeles’ first offensive drive, the coach-to-quarterback comms unit in his helmet died. Because of that, the QB put on backup Sean Mannion’s helmet and went on the field. One of those things to help communication included putting tape over the helmet’s earholes — which “helped tremendously,” according to Goff. “I wish I would have been doing it since the beginning,” he said. The communication issues are somewhat evident from the results of the first couple drives that were each only three plays — interception and punt. But Goff wasn’t really using that as an excuse, noting that he wouldn’t have said anything to the media about the communication issues had the Rams lost. But they didn’t, and Goff was a significant reason why. 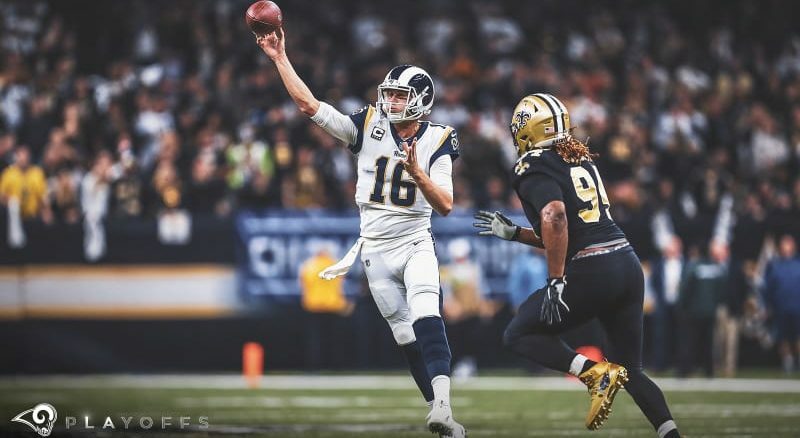 Playing in his first road playoff game in what could only be described as a hostile environment, Goff finished 25-of-40 passing for 297 yards with a touchdown and an interception. 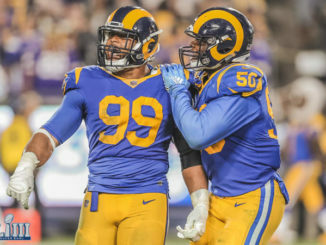 The 24-year-old quarterback seemed to settle in after the Rams ran a successful fake punt, early in the second quarter, delivering solid passes to tight ends Tyler Higbee and Gerald Everett, as well as picking up a first down with his legs on a scramble play. Then late in the first half, Goff was terrific on a two-minute drive, first connecting with wideout Josh Reynolds for 13 yards before dropping in two consecutive passes to wide receiver Brandin Cooks — one for 17 yards on 3rd-and-10, then another for 36 yards down the left sideline to put the Rams in position to score their first touchdown of the day. 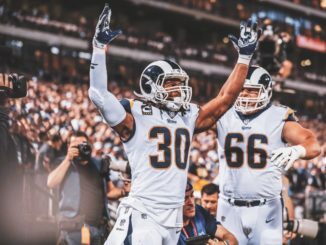 Goff noted part of what gave L.A. confidence on offense was just how well the team’s defense was playing at the time. Holding the Saints to just 13 points in the first half at home was significant, especially because one of their possessions started in the red zone after a sudden change. That was even in the second half, when Los Angeles started out slow with a three-and-out. New Orleans scored a touchdown to take a 20-10 lead, but Goff led the offense right back down the field, capping it with a one-yard touchdown to Higbee. And then Goff led L.A. to three key field-goal drives in the fourth quarter and overtime for the victory. 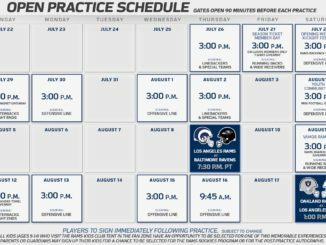 Speaking maybe a half hour after Zuerlein’s game-winning kick sailed through the uprights, Goff said he hadn’t quite processed the fact that the Rams will be playing in Super Bowl LIII. But what Goff won’t do is create any narrative about himself and how he’s taken a step in furthering his career. He gets asked about these kinds of things all the time — and it’s appropriate after winning a road playoff game to advance to the Super Bowl. And yet, he won’t shed the “California cool” demeanor — even when he’s just played a big part in helping a team advance to one of the biggest stages in all of sports. That’s just fine. It’s only noise he’d have to block out anyway.